Disruptive subscription business models continue to penetrate traditional industries. Take cinema, for instance, which is in the middle of a subscription revolution. MoviePass ignited the spark that revolutionized the movie-going experience. Buy one ticket, see one movie has held true for over a century. But by introducing a subscription business model, MoviePass offered customers the option to buy one monthly pass and see as many movies as they wanted, shattering the paradigm. But the deal was too good to be true; MoviePass' flame has since quickly diminished. However, the subscription-led disruption set in motion lasting change in the cinema industry, as it has done in many other industries. 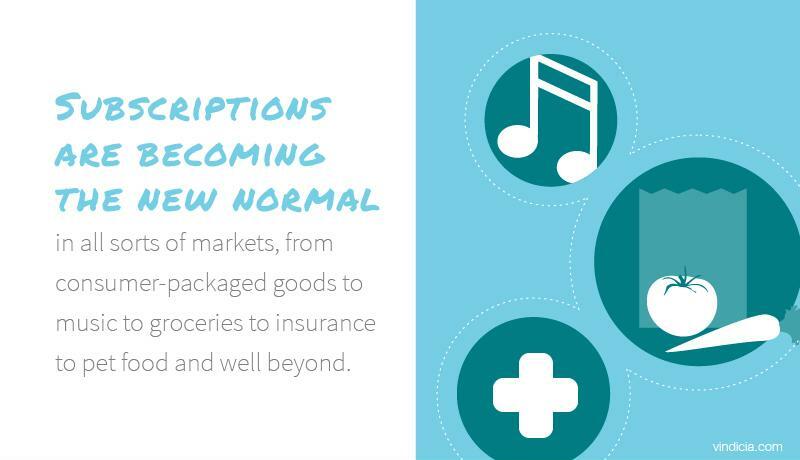 Subscriptions are becoming the new normal in all sorts of markets, from consumer-packaged goods to music to groceries to insurance to pet food and well beyond. And the growth is not fed solely by startups. While new companies continue to push and innovate the subscription business model, multinationals and established companies are just as likely to get in on the action now, which further entrenches subscriptions as a common and standard method for consuming services in our business and personal lives. Revisiting the example of movie ticket buying helps reinforce the fact that subscriptions are here to stay. Although MoviePass has gone through well-publicized turmoil, the subscription mantle in the cinema industry has been taken up by the traditional powerhouse AMC. Stubs A-List, the company's answer to MoviePass, allows customers to view up to three movies a week for around $20 a month – a model that is still generous but more controlled than MoviePass's "all you can eat." The subscription service — part of the larger Stubs loyalty program — gained more than 500,000 customers in fewer than five months, far surpassing expectations. The company credited A-List as one of the main reasons Stubs member households increased to 17 million in 2018 from just 2.5 million around two and half years prior. The subscription boom has also fostered collaboration between old and new, aimed at providing greater value for customers. AMC announced that it had teamed with Fandango and Atom Tickets, online-based movie ticketing platforms, to streamline online ticket booking for subscribers, who can integrate their A-List account with either app. The partnership also extends fee-free processing for members, and demonstrates just how fundamental subscriptions have become to the cinema industry. AMC is well past any testing of the waters, having dove straight into subscriptions, which are now a thriving segment for it. "Companies average 18 SaaS subscriptions and spend about $136,000 annually." While movie-going is more discretionary spending, software-as-a-service (SaaS) is critical to the function of many enterprises, whether they use software for human resources, supply chain, financial accounting, inventory, time-tracking, sales, customer relationship management, marketing automation — the list goes on. Software is crucial for any number of business processes, and it's increasingly being offered through a subscription. Blissfully, an SaaS management tools provider, estimated in a 2018 report that companies on average maintained around 18 SaaS subscriptions and spent about $136,000 annually, numbers the company expects to grow. Gartner has predicted that by 2020, 80 percent of all SaaS vendors (both legacy and new entrants) will have at least some offerings available through subscription-based plans. The inexorable creep of subscriptions has transformed into a full-on rush as subscriptions continue to redefine the SaaS market. With SaaS, software is offered through the cloud instead of physical packages. This set-up makes it much easier for companies to manage and improve services, as well as for consumers to use them. The old licensing model would make updates and upgrades a frustrating and time-consuming process. Cloud hosting has removed many of those pain points, while expanding capability to fine-tune subscription products. "Subscriptions provide better entry-level pricing and the ability to add features as customers mature and gain value from the initial experience," said Laurie Wurster, research director at Gartner. "This is especially critical for new entrants who want to lower financial barriers to new technology adoption and create sustainable, recurring revenue streams." Subscriptions are the new normal. Personal care is another leading example of how subscriptions are becoming the new normal. Who would have thought that a razor subscription service would pave the way for the model? Yet that's exactly what Dollar Shave Club did, opening the way for other subscription businesses and boxes to deliver grooming and lifestyle products right to the door of the consumer. Hawthorne is among the latest to embody the shift toward subscriptions. Like other leading subscription box services in the areas of apparel and personal care, the men's fragrance disruptor has built its service on customization, having customers complete an online quiz and profile to define their preferences and recommend the best products. Started by childhood friends, Hawthorne has set its sights on market mainstays like Procter & Gamble's Old Spice, and earned a cosign from Swiss-based Givaudan, the world's largest flavors and fragrance company. Hawthorne has deodorant, soap, shower wash and cologne products, among others, that it has carefully designed and artfully curated for customers, appealing especially to the millennial crowd. The subscription business model has made inroads in industries seemingly completely inhospitable to the approach. While a monthly box of personalized goods makes sense, a subscription for your home insurance? That's increasingly the case. Look to the rise of Lemonade, a US-based startup with a heavy focus on technology. The company uses artificial intelligence and chatbots to handle claims and customer service for monthly subscribers, with different products for renters and homeowners. Backed by Japanese giant SoftBank, Lemonade has converted a big share of customers from cornerstone insurers like State Farm and Allstate, and it's looking to expand internationally. Before Lemonade can make an impact in the UK, however, Aviva, one of the world's largest insurers, is trying to head off the subscription disruption by offering its own service. Called AvivaPlus, the pioneering subscription service will offer customers price renewal guarantees, greater flexibility, monthly payments with no annual percentage rate and no charges for canceling. AvivaPlus will be offered directly to consumers, bypassing brokerages, and come with three tiers of home or car insurance from which consumers can choose. How long till subscriptions disrupt your industry? The examples above are just indicators of how the subscription business model is taking strides into every conceivable industry, either complementing or replacing traditional models. The progress seems unstoppable. Whatever industry you are in, it's time to look into how to apply the subscription model, before some smart and agile start-up disrupts it.